Dead whale removal has long been an issue for humans who don’t want large, rotting carcasses taking up precious beach real estate. Perhaps the most infamous whale-disposal incident took place on November 12, 1970, in Florence, Oregon, when the Oregon Department of Transportation used a half-ton of dynamite to try to obliterate a sperm whale. Highway engineer George Thornton told reporters he placed the explosives in a position that would blow most the whale into the ocean. The beach erupted in a 100-foot high column of sand and whale. Chunks of the animal flew in every direction, and spectators began to scream and run for cover when they glimpsed large pieces soaring directly overhead. After the large pieces had fallen, it began to rain small particles of foul-smelling blubber. The explosion blew whale-blubber 800 feet, covering witnesses. One large chunk destroyed a car. 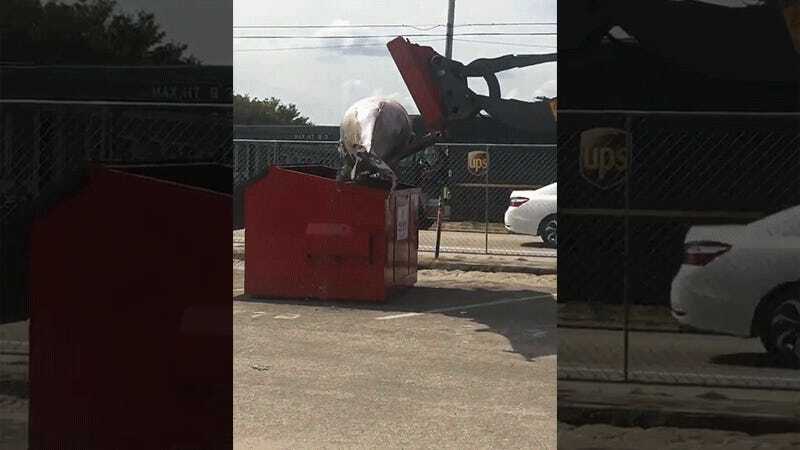 The latest whale carcass-related blunder occurred on Monday in Rye, New Hampshire, when a crew used a front-end loader to haul a 16-foot minke whale from a beach to a parking lot, and then attempted to plop the whale into a dumpster. Union Leader reporter Jason Schreiber documented the effort. As anyone with spatial awareness can see, the whale was too large for the receptacle. Ashley Stokes, leader of the Seacoast Science Center Marine Mammal Rescue Team, told the Union Leader that the town of Rye brought in the machinery, but the state contributed the dumpster. Unfortunately, the state was not given the measurements of the whale and provided a dumpster that could only fit a baby whale. The crew decided to give it a shot anyway, and the whale slipped off the trash bin onto the pavement, where it is said to have remained overnight. A larger dumpster arrived Tuesday morning, and the whale was successfully placed inside and taken to a facility where marine biologists can perform a necropsy to determine how the whale died.